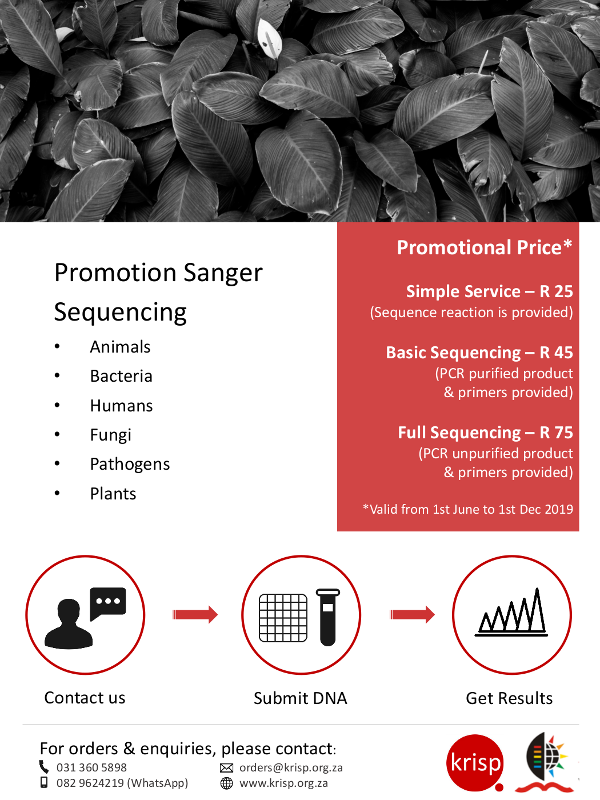 KRISP is running a Sanger Sequencing promotion to celebrate the launch of two new Sanger Sequencers (ABI 3730xl and 3500). Unbelievable prices for the first 6 months. Capillary electrophoresis only – R 25 (per sample well). Sequencing of PCR purified amplicons – R 45 (per primer). Sequencing of PCR unpurified amplicons – R 75 (per primer). - Address: Nelson R Mandela School of Medicine, University of KwaZulu-Natal, 719 Umbilo Road, Durban, South Africa.